The life of the church generates out of worship for God and with God's beloved community. We celebrate how God is working in the world through worship. We practice an ancient circular rhythm of gathering in hope, hearing God's Word, sharing God's meal, and being sent into creation bearing God's grace. It is a rhythm rooted in ancient times, while trusting Christ's presence will continue in the world into a far distant future. Holy Cross follows the rhythm of story found in the "Revised Common Lectionary." It is a pattern of reading one of the Gospels throughout the year--we share this practice with many Christians around the world. We sing old and new songs. We are both rooted in tradition and liberated from tradition. Our two most sacred rituals are baptism and communion...these are sacraments. A sacrament is something drawn from the earth, of life-giving importance, (water, wine and bread,) that Jesus conferred a special meaning on with holy words and action to convey God's grace. 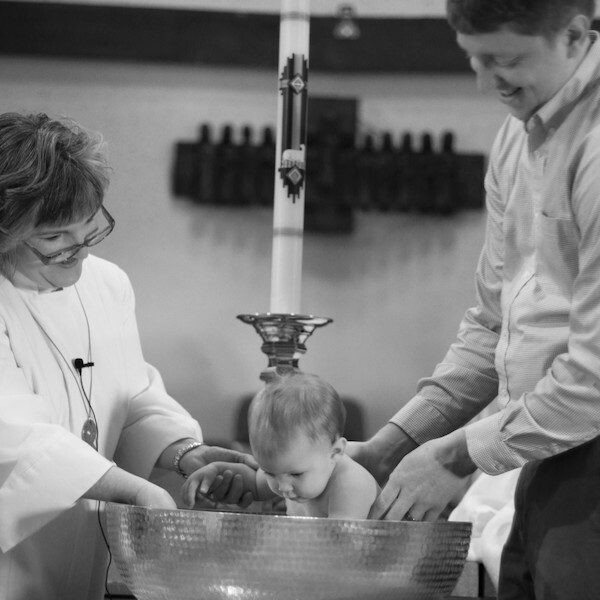 Holy Baptism is our birth into the community of church. Holy Communion nurtures us throughout our life around God's table at the holy meal. All are welcome. We recognize God sees, knows, and loves each one...as demonstrated in the life of Christ. We hope to be a place where all are seen, known and loved among God's creation. 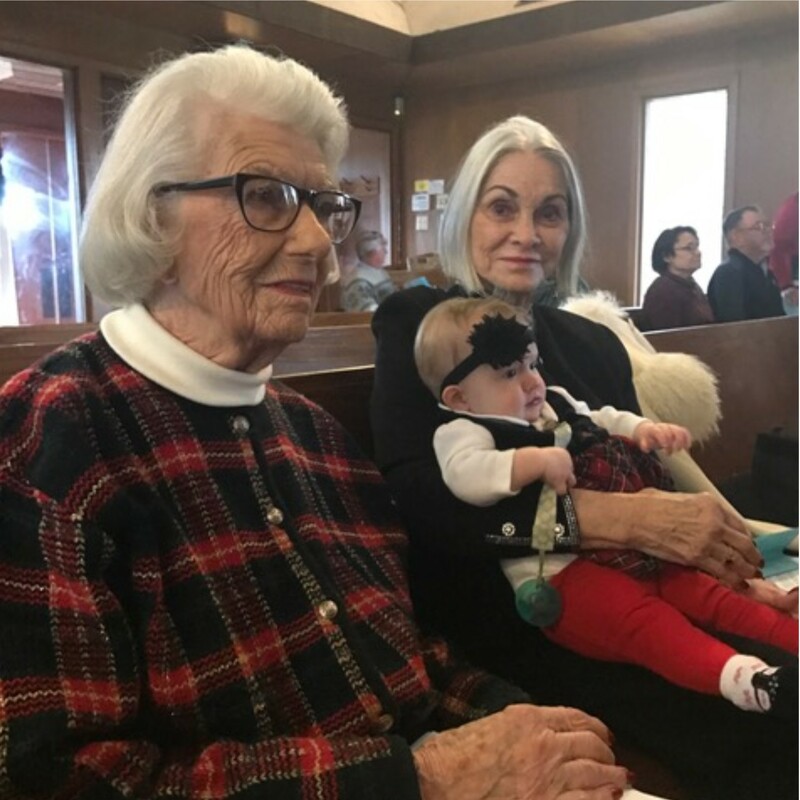 We welcome folks through baptism when they are very small babies, children, young adults or very old. God is the primary actor in Baptism, so no one needs to feel like they need to know, do, or say something enough to receive God's grace. It is already done for you through Christ. We recognize God's grace is so complete and full in baptism, it doesn't ever need to be re-done...even if you wonder if it "took" or if it happened before your memory or in another denomination. We trust the Spirit of God is at work in our lives through the promises of baptism. Youth, adults and parents have a time of getting ready for baptism that includes learning about scripture, theology and practice. Sometimes, at the beginning of worship, we give thanks for baptism. We say words that remind us of God's and the community's promises. You may even get a little wet as the pastor sprinkles the community with the baptismal water during a song! Sometimes, we mark special milestones with an "Affirmation of Baptism"...like a rite of passage or celebration. These are special times to celebrate how God has called us to our unique and special roles in the body of Christ. If you would like to be baptized or bring a loved one to the font for baptism, make time to visit with Pastor Sharolyn to find out how the church will expand to receive you through Holy Baptism. Read more about Baptism here. Just as baptism is like our birth into a family, Communion is like our nurture around the family dinner table. It is where we re-connect and re-member as Christ's body. The bread and wine, somehow are more than that...they become Christ's broken body and blood shared for the sake of the whole world. It is full of ordinariness and full of overwhelming mystery. We find at this table connection with the whole world...and in all of time. Christ's forgiveness, mercy and grace is poured out at this table. Communion is so mysterious, one may go a whole lifetime, and not fully grasp its meaning and beauty. 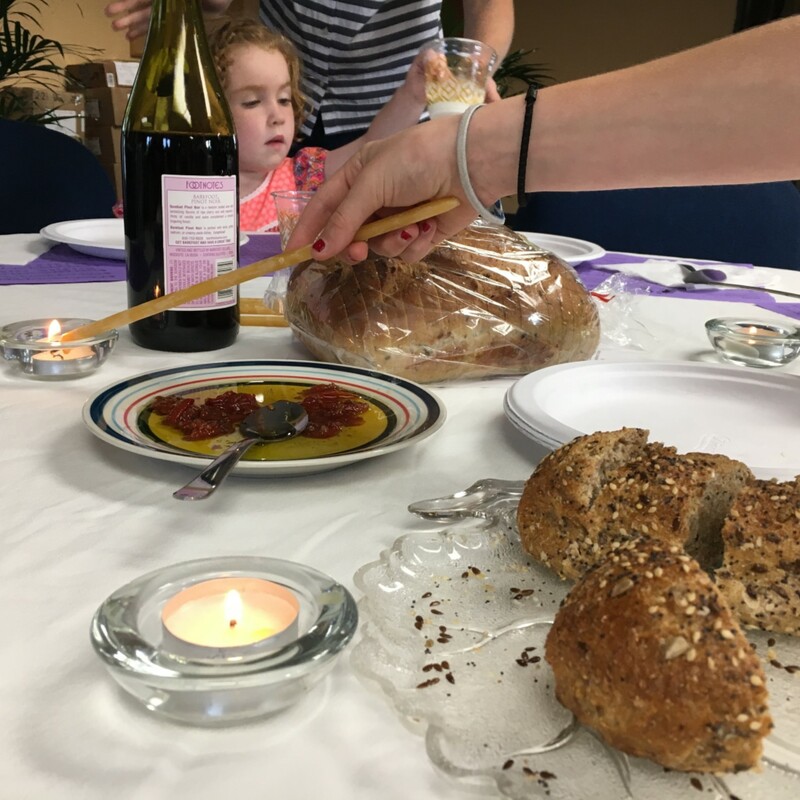 Children, indeed all of us, learn about communion, by coming to the table. There may be a day their tiny hands reach out for the bread...because they sense it is for them, too...and it is. When children show a desire, they are ready. If any one reaches out for the bread, they will not be turned away...this is Christ's table of welcome. 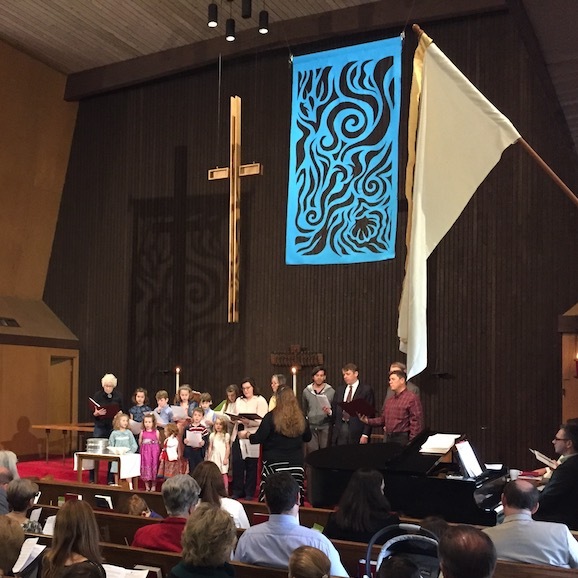 Children have particular lessons in Godly Play they will hear over and over again to help them recognize God's presence around the communion table. This photo is from a very special Communion shared here at Holy Cross on Maundy Thursday called the Agape Meal. Would you like to read more about Baptism or Communion? The ELCA has a wonderful document called The Use of Means of Grace that you may find meaningful about the Sacraments in the Lutheran Church. Through our understanding of God's baptismal covenant, we recognize our vocation in the world is a part of God's work. It is as if our whole life is one long worship liturgy celebrating our baptism. That life is punctuated with events worth celebrating in community. Together we gather to lift up ordinary moments and things to see God at work: Blessing of the Backpacks, Blessing of the Animals, Blessing of the Bicycles, Blessing of the Seeds and more. We mark events in our wider world with prayers of joy or lament. We celebrate with individuals when things are happy in their lives and when things are sad. Because we see that all are seen, known and loved by God, we delight in celebrating weddings...as the baptismal journey sometimes lead to life in partnership with another. Folks seeking to be married at Holy Cross are invited to contact Pastor Sharolyn. When the baptismal journey comes to a close, and death is near, we will be with you. We will gather with you at the deathbed of a loved one, to help give voice and song in thanksgiving and celebration of life. We will accompany you in the funeral, the last part of the long baptismal liturgy. And when the casserole dishes have all been returned, we will still be present with you to remind you Christ is here too. Every time the earth moves around the sun another year, we see new things for the first time and old things again and again. There are three big celebrations in the church: Christmas, Easter and Pentecost. 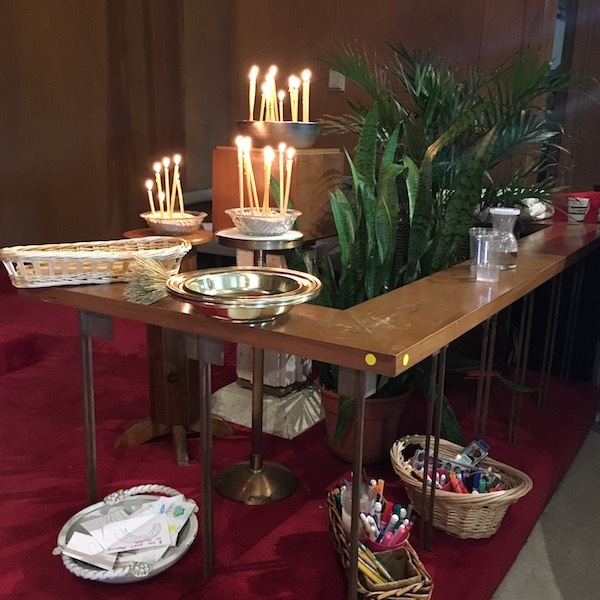 Each has its own time of preparation and celebration: Advent prepares us for Christmas, Lent prepares us for Easter, and the season of Easter prepares us for Pentecost. We worship every Sunday morning at 10 am with Holy Communion.